Tomorrow is just another day. Check back here tomorrow for an exciting announcement from iTunes. We know that iOS 4.2 should drop tomorrow at 10 AM PST, and we know that iPhone and iPad users will be able to download the software update using iTunes. Will Apple change the system underlying the whole software update process? But then again, how would that be something we’ll never forget? What comes to mind if the long-awaited “iTunes in the cloud”, based on that huge data center Apple is building in North Carolina. 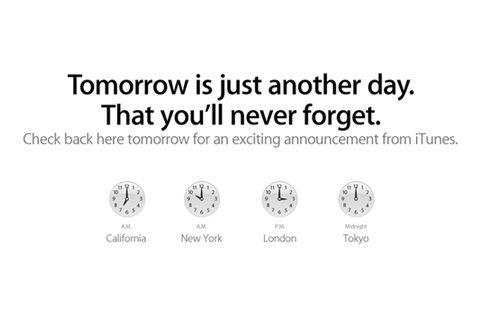 We’ll check back tomorrow at 7 AM PST.